As promised, I am writing a trip report for my trip last May 15, 2006, from Buffalo to Prague, connecting via New York City and Zurich. So sit back, grab a bag of chips and relax. 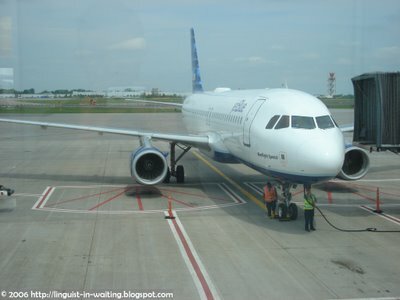 Around 10:00 AM on May 15, I arrived at the Departure Hall of Buffalo's own airport. Nothing really special here, but it should be noted that the airport is particularly clean, and there isn't a lot of long lines. A Chinese passenger, perhaps a student, was in line on the JetBlue check-in, but she was waiting for another passenger, so she let me go ahead of her. I thus checked my baggage, which I left unlocked (The TSA wants to inspect the contents, in case the X-Rays go DING!!!). Good thing I have two luminous bright green belts that I have put around the suitcase. I do pack light, in case any of you have wondered. I will be away for two and a half months, yet I only brought one suitcase with me, plus a briefcase and a laptop. I only have two pairs of shoes, which consist of one leather pair and one sneakers. Talk about efficiency. So after the check-in, I got my boarding pass, which was very flimsy. Of course, it is a low-cost carrier, so I guess this is one of the ways in which they save money. It looked more like a receipt than a boarding pass. Anyway, so I went to the snaking TSA line, which moved fast, I guess I was only there for about 5-10 minutes, when it was my turn to take my laptop out the case, remove my belt, and also my shoes. I'll have a comment regarding the shoes later. So, after the security check, I was sitting near Gate 8, waiting for about an hour and a half before my plane will arrive. There is an earlier plane there, and so the people there were still waiting for the earlier plane. I then started fumbling with the Czech Phrasebook that I brought with me. The terminal had a bright glass window where you could see the plane, and as I was observing the people loading the luggage, I saw MY luggage, being loaded on to the earlier plane! I didn't know whether they had correctly tagged my luggage, so I brought this to the attention of the flight attendants that were chatting near me. Of course they asked whether I am sure that that was my suitcase, and I said yeah, because of the two luminous belts around it. But they assured me that it would be there in JFK and would not be lost, at least it wouldn't be left behind, they say. So that makes sense. If the previous plane had extra space and there are bags to transport, then why not? This was the plane that carried my bag. This on the other hand was the plane that carried me. I sat on 22F, a window seat. A lot of people were anxious to use the DirecTV apparatus of JetBlue, and the flight attendants are making this their catch phrase even in boarding, like You can enjoy our 36-channel DirecTV service as you fly from Buffalo to New York City! I fumbled with it a bit, but since the trip was only an hour long, and that there was nothing interesting on, I just shut it off. Of course, there was a snack service, something that is rare in US major carriers. I had a Coke and a cookie. Nothing special about that. I then arrived at the old Terminal 6, which is the terminal that JetBlue uses. As I assumed, my luggage was already in the luggage carousel when I got there, while the other people in the plane with me were still standing around waiting for theirs to pop out. I then pulled my suitcase and asked the Information staff on how to get to Terminal 4 from here. So she said to take the AirTrain and get off at the next station. Easy as that. Right, left, cross the street, left, and an elevator. As I was on my way to the next terminal, I saw this. JFK's landmark terminal, Terminal 5. 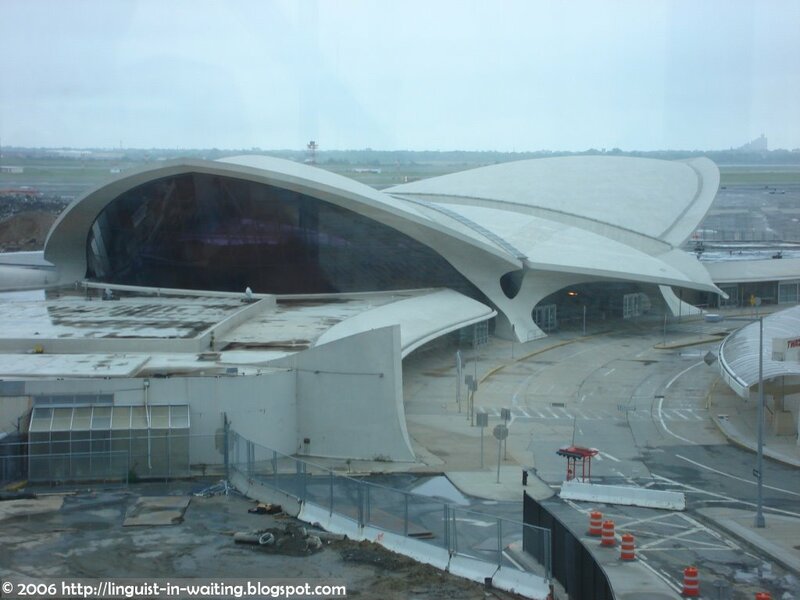 Designed by Finnish architect Eero Saarinen, this was the former TWA terminal, now under construction after a prolonged period of unuse. I have heard that JetBlue would extend and use this terminal for their operations too. I reached Terminal 4 with no hassle. 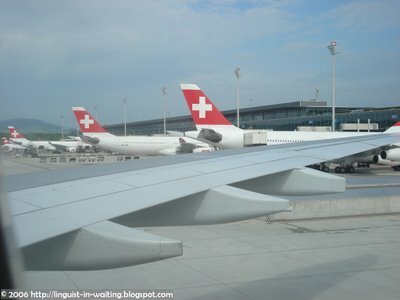 Then, I needed to find the check-in counters for Swiss International Air Lines, which would be my next leg. By the way, did you know that it is more expensive to fly direct from New York City to Prague? Czech Airlines have a direct service, but it is more expensive, so I chose Swiss instead. 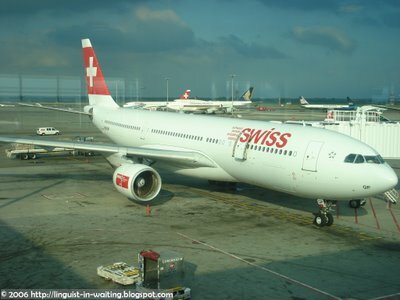 Besides, Swiss has newer planes, and Czech still uses their old A310s. The Swiss service is better too. So I checked my luggage in. I waited for about 10 minutes before the people in front of me were checked in. Apparently, there was a group tour going to Tel Aviv, Israel, connecting thru Zurich. Most of the bags I saw were tagged ZRH-TLV, so I knew why. Mine on the other hand was tagged ZRH-PRG. 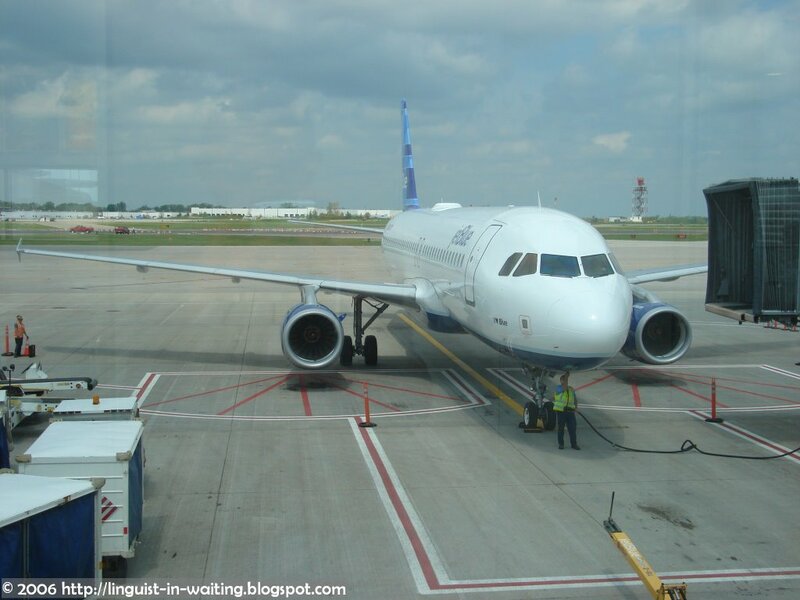 When it was my turn, the agent asked me whether I would like to be on an earlier flight. Swiss operates two flights to Zurich and one flight to Geneva every day from New York City. In theory I could catch the earlier Zurich flight, and there is also an earlier Prague flight from Zurich, but then I already reserved my seats, and I am particular about getting a window seat, so I declined the offer. I then dropped my checked luggage to the TSA agent, and then went down the duty-free area. I didn't buy anything, but instead, I went to a bar called BAR AVION and had lunch, or something like it. A Spinach and Cheese Quesadilla and a Guinness Drought. The Hispanic waitress doubted my age. She: How old are you? LIW: 23. I have my passport if you want to take a look at it. Apparently, I look young. I'd take that as a compliment. Since I had 7 hours to burn, I didn't rush, and took out a dissertation that I need to read over the summer, while waiting for the food to arrive. And so even after the quesadillas came (which was good, by the way, and nicely paired with the Irish beer), I went on reading an opus by someone about embedded tenses in conditionals. After an hour, I paid my check, got out of the bar, and went to the direction of the gate where my flight would be leaving. Because of that, I needed to pass another TSA security check. So laptop, belt and shoes came off again. As I was in the line, there was a young woman, probably around my age, with a British accent, and she was carrying a lot of bags. And they were heavy, so she just kicked them around. She was very vocal about the ridiculous policies of the TSA regarding the shoes. I offered to carry one of her bags. LIW: Do you want me to take one of them for you? UK Girl: Nah, I'm alright. UK Girl: Ok, you can carry this bottle (a bottle of water in a plastic bag). So that I did, accompanying her to the checkpoint, at which we heard the TSA guy give a loud, yes, a very loud yawn. UK Girl: *aloud* Whoa! That's a very huge yawn you got there! *to me* Why do we need to take off our shoes? LIW: Well, it's called paranoia. LIW: Hmm, a burgundy passport. Which country issues that? UK Girl: The UK. I'm British. Did you know that two years ago, they weren't this strict. Last month went I came in, they even took my photograph and fingerprints! How ridiculous! Anyway, so my conversation with UK Girl came to an end when she went to another gate and I went to mine, which was B29. She was on the Virgin Atlantic flight going to London-Heathrow. I also took some photos of different planes that go to JFK. Some of these planes I never saw before in person, due to the fact that they didn't go to the Philippines. Some of these included Air Tahiti Nui flying to Pape'ete, El Al Israel Airlines flying to Tel Aviv, South African Airways flying to Johannesburg, LOT Polish Airlines flying to Warsaw, Aer Lingus flying to Dublin, among others. Of course, I have photos of my ride. This is the plane that I would be on. Registered HB-IQP, this is an Airbus A330-200. Every seat is equipped with a PTV. Again, I seldom used mine. The boarding would start at 8:00 PM, so I burned time by plugging my laptop on to a socket and watching episodes of the Amazing Race 9. Around 8:10 PM, the announcement to board was given, and I started to get in line. Nothing special. The action started in the jetbridge. The people were held from boarding, including me, because a guy was acting obnoxious and was being prevented from boarding by the staff. The reason was because he had excess carry-on luggage with him. And he was giving ridiculous reasons as to why he wasn't notified of that, yada yada yada. In the end, he needed to gate-check the other one. So I found my seat, and the obnoxious guy turned out to be sitting in front of me. I was on 30K, and he was on 29K. After fifteen minutes, he approached the flight attendant, and said that he wished to switch the bags. He wanted to carry the one he gate-checked previously, and he wanted to gate-check the one he has right now. How ridiculous. He then gave the reason that he had six weeks worth of train tickets there in the other bag, plus medication, yada yada yada. He also gave a veiled threat to the flight attendant on how furious he would be if those items got lost. Obviously, he isn't an experienced traveller. Or perhaps he is, he is just so high-nosed that he thinks he is always right. I felt pity for the Czech woman that was sitting next to him, because his actions meant that he always asked the Czech woman to stand up plenty of times for him to pass through (I only found out that she was Czech when I saw her in the same plane for Prague.). Another obnoxious person was sitting in 29G. That is one seat beside the aisle seat in the middle rows. He was an Orthodox Jew, complete with a black hat, a flimsy vest, a black suit, and yes, the long curls of hair on both sides of his face, and the long uncut beard. He looked like he never flew before. He was worried that one he put his carry-on luggage on the bins above, he would never be able to take them while in flight. So he took out his food (Yes, he had a packed dinner, since he didn't think that there would be food in flight. ), plus plenty of other items. The man on the aisle was so annoyed with him, that I think he didn't allow him to pass and get out. So once the plane was on cruising speed, the Jew got up and never came back. I guess he found an empty seat somewhere and sat there. I only saw him again when we were in Zurich, because he retrieved his luggage. I guess he was also bound for Tel Aviv as well. The man sitting next to me was a Polish man, I realized that when he asked me a question about an hour before we were to land. The screen flashed all the connections that were relevant to the passengers in that flight. He asked me how to go from Terminal E in Zurich to Terminal A, where his flight to Warsaw would depart from. So I explained it to him. By the way, did you know that if you order a special meal, say a vegetarian meal, you get to eat earlier than the other people? That is because they serve the special meals before the regular ones. So I was served earlier, hehehehe. After 7 hours and 40 minutes, we touched down in Zurich Airport. Upon touchdown, I was amazed by the unreal blueness of the sky. 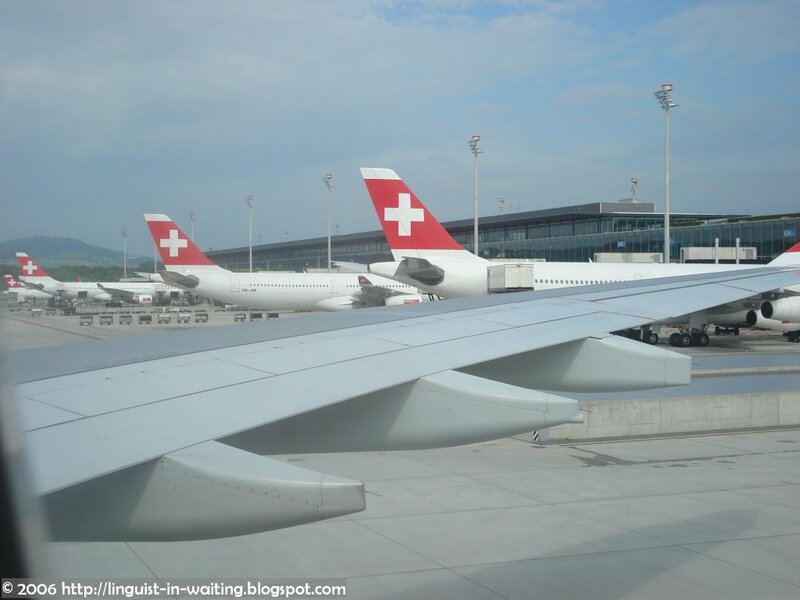 Then I saw the terminal, where all the long-haul flights from Zurich depart. Here is a shot. I believe those are the Swiss planes that came from Boston and Miami, because if I remember correctly, they arrive about the same time as we do. They would then be prepared for East-bound flights, like Tokyo, Tel Aviv, and Mumbai (I guess it is obvious that I am an aviation enthusiast.). Upon docking with the jetbridge, I proceeded to find the gate for my connecting flight. But then, I came upon the Airside Center, where the Swiss duty-free shops are located. I must say that this is the best airport I have been to, better than Kansai International Airport in Osaka. The interior is more wooden, it has a sophisticated feel to it, while Osaka had too many steel pipes and tubes. Zurich on the other hand limits the steel and tubes to the ceiling. All the rest have a department store type of interior. This is a shot of Zurich's Airside Center. Everybody passes here, and depending on which terminal they depart from, then they would either go to the left, right, or take the train in the middle to the midfield terminal. Due to the two-hour lay-over, and the discovery of a wireless zone within ZRH, I connected my laptop to the internet, and checked my e-mail and posted yesterday's entry. The wireless zone had a lounge-slash-bar feel to it, again, due to the nice furniture. So I needed to go to Terminal A, which is where my Prague flight departs from. There was another security check, and I needed to take my laptop out of the case again. I asked the Swiss security agent whether he wanted my shoes and my belt. LIW: Do you want my shoes and belt as well? Agent: No. Just the contents of your pockets. LIW: Ok, 'cause in the US, they do that. So anyway, final security check over, and I was let through. I waited for about 30 minutes before they called for boarding on Gate A07. An exception to the Prague flight was that they needed to stamp the boarding pass and check my passport before letting me board. So a guy named Andrew asked me a few questions about my trip. He seemed American working for Swissport, because he didn't seem to have a European accent. So, we boarded a smaller plane this time, and as soon as I got in the plane, it started raining really bad. But it didn't delay our flight. An announcement was made about the delay of 10 minutes, but that was it. By the way, if you are riding with Swiss, expect that the announcement would be said in English, French, and German. I think that all their staff are at least trilingual, due to the linguistic situation in Switzerland. Amazing. During the flight, we were served with some bread and drinks. I was on the window seat of a row that sits three people, but there wasn't anyone sitting in the middle seat. There was a lady in the aisle though, and she spilled coffee. I immediately handed my napkin to her, which she repaid by giving me one of hers in her bag. But she needed a napkin fast because the coffee was creeping to her clothes. After an hour, we touched down in Prague, which was a quiet airport. I proceeded to the Border Patrol, who stamped my passport with an entry stamp, and got my luggage. Then I went to Customs, who asked me whether I would have some things to declare. But since I answered in the negative, I was let through. I then went out the Arrivals Hall and in ten minutes, I saw my parents. re: taking off shoes & belt at the airport... ganyan din di ba dito sa atin sa Pinas? hehehe! typical Pinoy gaya-gaya sa mga Kano mentality. 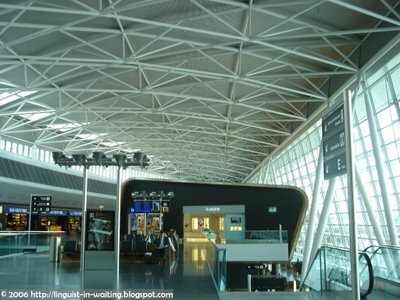 Thanks a lot for the travel report,as I am another linguist planning a european trip in April and can use use information about the "security" harassments going on at all airports.